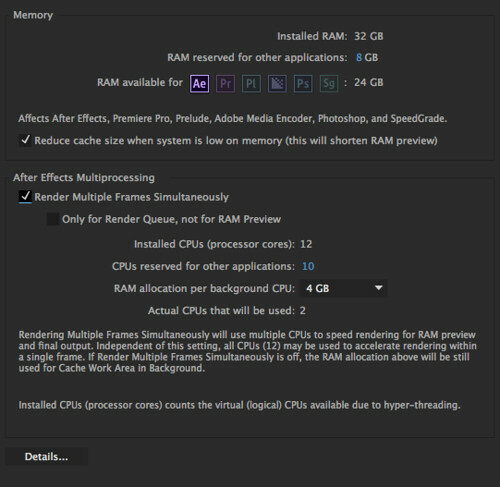 Once I upgraded to CC "2014" I have been unable to use AE with Multiprocessing On. I figured I would try again and maybe troubleshoot a bit. I think I may have pinned it down to the Neat plugin but i'm getting some strange behavior so im not all sure. I use Neat with almost everything I do. So, without the plugin everything works fine MP On. Once I load it on a sequence I can use the plugin fine, along with the optimization in prefs which I find strange to begin with. It seems to be working within the program under regular use. Once I add to render queue and render, things go south. 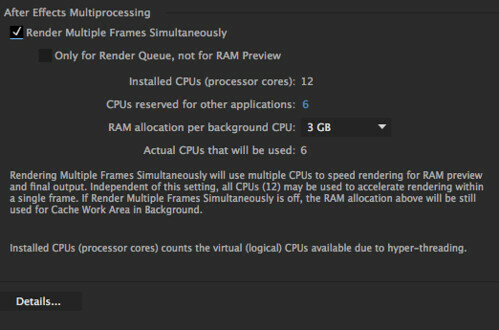 If I try and let it render anything small or large, it takes about 4-5 minutes to start, giving me thick red bars in activity monitor until it does with multiprocessing off and the message, "unable to open projects in background"
If I stop the render before it begins during the "wait", the red bars in activity monitor wont go away at all. Even after quitting AE. Can't reproduce this situation with another Plugin, so i'm calling it on Neat , I don't mind not using MP but I would like to! . Any help in this matter would be much appreciated. 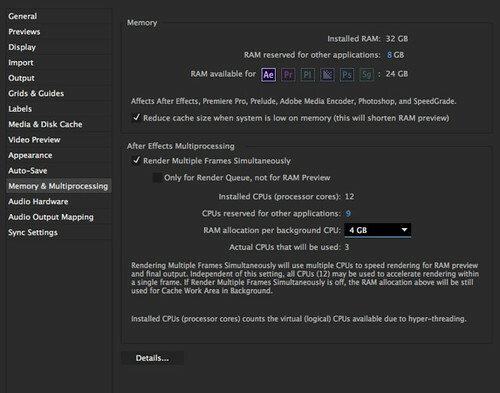 When you use MP in AE you need to limit the amount of GPU memory allowed to NV, otherwise multiple instances of the filter will try to use it all will possibly conflict over that resource. 5. 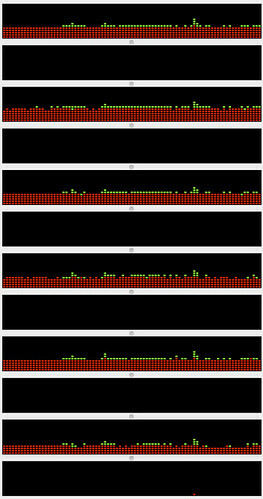 Repeat the steps 2-4 to find the number of instances that delivers the best results (the fastest render, no stability problems for the Mac). It is quite possible that the best number of instances is going to be 2 or 3, and it is probably going to be lower than the maximum possible amount allowed by AE. 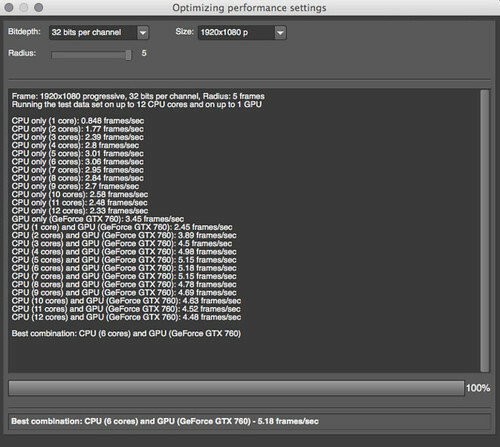 So I tried Bringing the GPU Memory down to 5% then 10% running an exact set of tests, I had it set to 25% originally. 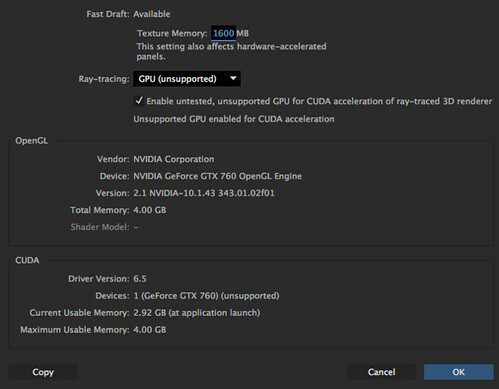 This is where I would like to be in terms of MP settings, which worked great until Adobe CC "2014"
So again, I was not able to run in MP mode, if there is anything more I can do please let me know! Thanks! Thank you. That looks unusual. Do you receive any error messages in the system logs when you try to enable and run AE with MP?